There are certain teams you watch in the UEFA Champions League that seem to consistently produce some of the best attacking players in the modern game. Over recent decades the likes of Inter Milan, Chelsea & Ajax have been recognised for their large scouting networks, loan systems, and youth academies, but none of these clubs however seem as dedicated to recruitment and development as FC Porto. Despite having not won Portugal's top-flight domestic competition, the Primeira Liga, for 4 seasons, FC Porto is widely regarded as one of the fiercest competitors in modern European football. Renowned for appointing Jose Mourinho in his first managerial role back in 2001, the club currently are the second most decorated team in Portugal's history with 74 trophies. In many ways however, they are arguably the country's most famous team, having been dominant within Portugal throughout the 1990's, winning 5 consecutive titles between 1994 - 1999, and being the only side in league history to have won two titles without conceding a single defeat (2010-2011 & 2012-2013 seasons). FC Porto have also managed to achieve continued success in European competition - the club won the UEFA Cup/Europa League in 2003 & 2011, and took home the UEFA Champions League in 1987 and more famously in 2004, under Mourinho. In recent years however, financial crisis has engulfed the nation of Portugal and hit the Primeira Liga & it's top three teams - Porto, Benfica, and Sporting - harder than most. Portugal is burdened with one of the highest public debts in the eurozone, and weak growth has held back the economy for more than a decade now. This in turn as seen average match attendance in the Primeira Liga drop significantly, and seen commercial partnership opportunities do the same, as investors look to neighbouring countries and leagues with larger viewership and worldwide marketability. How exactly then have Porto managed to maintain their on-going success in European competition despite the Primeira Liga being significantly behind the 'Top-5' European leagues? Remarkably FC Porto have reported a net profit of over £300 million from transfer dealings in the past 10 years, only recording a single season where they had a negative transfer spend in that time period (2016-2017). During this period FC Porto won; the Primeira Liga 5 times, remaining unbeaten in the league for 2 separate seasons, they won the Taca de Portugal 3 times (Portuguese Cup), the Supertaça Cândido de Oliveira 5 times (Portuguese Super Cup) and finally, the UEFA Europa League in 2011. The most telling statistic that highlights FC Porto's consistency at the top-level is that they've reached the group-stage of the Champions League for a record equalling 22nd time this year - only Real Madrid and Barcelona are on a par in terms of campaigns in European football's elite club competition. Antonio Henrique, who was Director at FC Porto until 2016, clearly recognised the importance of recruitment and development as a fundamental pillar within the club's business model. He became Head of Recruitment in 2005 and has been responsible for bringing in some of FC Porto's finest players who were in turn became marquee signings at top clubs all across Europe. In 2005, Henrique brought in Lisandro Lopez from Racing Club in Argentina for £2.07 million who became one of the league's top scorers and won 4 league titles before being sold to Olympique Lyon for £21.60 million in 2009. That same year Henrique brought in Radamel Falcao for £4.89 million from River Plate who went on to score 25 goals in 28 games in his first season at 23 years old. He was sold to Athletico Madrid in the '11-'12 season for £36 million. In 2010 Henrique found James Rodriguez at CA Banfield in Argentina and brought the player to Portugal for £6.62 million. The player was only 18 when he signed but became one of FC Porto's best players the following year. He was later sold in 2013 to Monaco for £40.5 million. In 2012, FC Porto purchased Jackson Martinez from Mexican outfit Jaguares for £8 million and after 67 goals in 3 seasons he was sold to Athletico Madrid for £33.39 million. As you can see in the table, these are only a few of the incredible transfer deals FC Porto have managed to pull off in the past decade. Remarkably, out of all the players FC Porto have sold in that time period, 23 of them were sold for a collective £538.25 million. Given the clubs success in the transfers market it comes as no surprise to see Antero Henrique, FC Porto's Sporting Director until 2016 become the Sporting Director at Paris Saint-Germain this May 2017. Former FC Porto manager Andre Villas-Boas with Antero Henrique in 2013. In order to find and recruit these players to FC Porto, Antero Henrique and the club built and harnessed a powerful network of scouts across the globe with an added emphasis on South America. FC Porto scouts large pools of players and develops them through various academies and subsidiary teams in the hope that one or two of these players will eventually become the club's next big marquee player. The club utilises an FC Porto B team that play in the Segunda Liga, and the Premier League International Cup - this year they are in a group with Arsenal U23's & Bayern Munich II. Alongside this FC Porto maintain a number of youth sides and operate academies across the world. Despite FC Porto maintaining an incredibly successful recruitment and development system, there is a sense that this isn't necessarily the ideal situation to be in as a football club. Football is of course a business and in the games of football and business there are both winners and losers. Relative to their European counterparts FC Porto seem to fall into the second category - the economic climate within Portugal and the economic standing of the Primeira Liga itself, dictates that FC Porto cannot compete financially with the other top European clubs, who enjoy increased revenue from broadcasting rights, commercial partnerships, merchandising and ticket sales given the infrastructure and popularity of their domestic leagues. FC Porto have had to adapt to their circumstances and have found consistent success through recruiting aspirational young footballers with raw talent from unknown places, and developing them in worldwide superstars. There weren't many bigger superstars after the 2014 World Cup than James Rodriguez, and Antero Henrique was the man who brought him to FC Porto from Argentina in 2010 for £6 million. 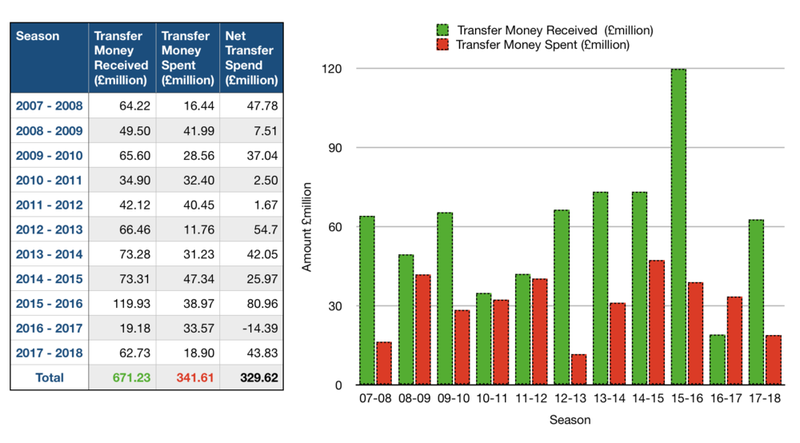 FC Porto's consistent success in the transfer market has translated to consistent success on the pitch both in Portugal and in Europe's top-flight competitions, and has off-set the less than significant revenue they receive from other channels of their business (match day sales, broadcasting deals, commercial partnerships). The club's emphasis on scouting young talent and developing players should be a model for other clubs in similar financial situations, as it has made FC Porto one of Europe's most consistently dominant teams in Europe in recent decades.